"Bucktailing, an Exciting Saltwater Flyfishing Tool"
Whatever fly tying materials you are using, 'Buck tails', 'Polar bear hair', 'Fishair', 'Krystal flash', or, 'Peacock herl', it is synonymous with one of the most exciting and effective salmon fishing methods practiced in B.C. 's Pacific salmon waters. The most common term, 'BUCKTAILING,' signifies a method of fishing effective not only for salmon but also for larger trout in lakes. It is a method where the angler trolls his fly behind the boat, at varying speeds, but usually fast enough to hold the fly just under the surface. The origin of the term refers to the long hairs on the end of a buck deer's tail which were used as the original material for the fly. Today, with an abundance of artificial materials available to the angler, these new materials have acted as a successful substitute for the white and various dyed buck tails, however, deer hair is still used. It appears that the earliest references to bucktail flies in British Columbia comes in the early part of this century where cast salmon flies using deer hair were used. These flies called, 'Salmon Bucktails,' were tied on large hooks, usually size #2 or greater, with a silver tinsel body and long streamer strands of deer hair, brown, black and white, from a blacktail deer's tail. They were effective flies according to A. Bryan Williams, British Columbia's first Game Warden. 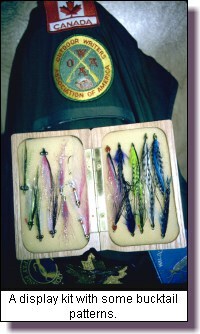 In his writings he refers to the most common salmon fly fishing method being fly casting in the estuary of coastal streams with these various 'Salmon Bucktails' for cohoes. According to Mr. Williams, writing in 1935, in his book, "Fish & Game In British Columbia," "The Cohoe is an excellent sporting fish, he will take the fly well both in the sea and fresh water whenever conditions are favorable..." "... he (the coho) jumps much more frequently and dashes about in such a wild way that considerable skill is required to play him." 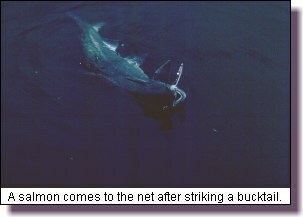 Bucktailing is a salmon fishing method initiated and perfected in water of Georgia Strait. This method of salmon fishing appears to come from the Cowichan Bay area where bucktails were trolled from the row boats in the area. With the introduction of outboard motors, bucktailing came into it's own. 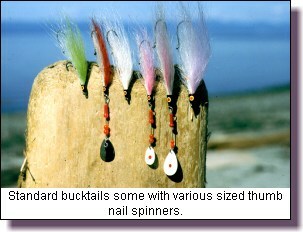 Today, large full bucktails with trailer hooks are commonly called, 'Cowichan Bucktails,' in recognition of this area as the origin of this special sport. Vivid in my memory is the first coho I hooked on a bucktail fly while bucktailing along the Salmon Point kelp bed south of Campbell River. I can still see the high "V" wake of water boring down on my fly as the coho came in to strike. Hooked on the trailer fly, he cartwheeled and skywalked behind the boat, outlined in the silver froth of the motor wake against the silhouette of dark blue water. The pulsating rod in my hand, as meter after meter of line screamed from the single action reel, firmly convinced me that this was one of the premier salmon fishing experiences on the west coast! In recent years, as I have experimented with a wide variety of salmon fly patterns, I have found that bucktailing gives me that much needed confidence in my flies. Unlike the traditional bucktail fly with it's keel and trailer hooks, I have found that single hooks are just as effective. I prefer a stainless steel hook, MUSTAD 34007 or 34011, as they will not tarnish after repeated use in saltwater and back in my fly box. I prefer sizes # 2, #1 & #1/0 although I do tie flies up # 5/0 for this purpose. I emphasize silver simplicity in my patterns. 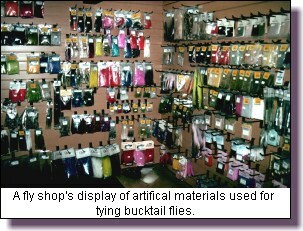 I have found that thin strands of material tied directly on the hook without tail, body or hackle are very effective. For variety, I would recommend that you experiment with strands of color, or tinsel bodies but, above all else, keep it simple! Baitfish do not have hackles! Silver bodied fry are the primary feed for salmon and this is what you try to imitate to decoy these highly exciting fish. This experimentation while bucktailing has given me a solid base of fly patterns which I know will catch salmon. As the season advances and I am able to take up traditional anchoring & fly casting methods, I KNOW that these patterns will hook fish! 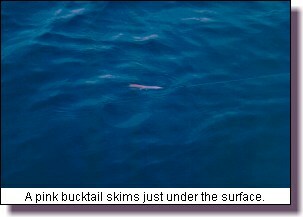 'Skip Fly Bucktailing,' has become an exciting adaptation of the traditional bucktailing method. 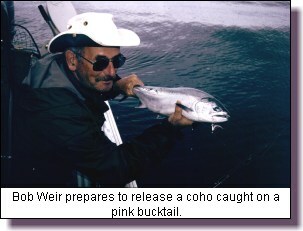 This method is effectively used by guides to ensure the "V" wake strike of coho and, on occasion, chinooks for their clients. In this method, the boat is driven at a speed which has the trolled fly skimming just under the surface. Once the speed is established with the rod tip pointing at the fly, the angler repeatedly pulls his rod tip towards the front of the boat but horizontal to the water effectively 'skipping' the fly out of the water. He then points his rod to the back of the boat which in turn lays the fly in the water in a crippled fashion. The traveling boat soon picks up the slack line and the process is repeated. Most strikes seem to come just as the angler is beginning the process of pulling the fly. Strikes are usually visual and dramatic! Beginners have to be cautioned to hold tight otherwise the rod can be pulled right out of their hands when a fish takes the fly! If there is one thing which separates bucktailing from trolling, it is the speed that you travel when your fly is out behind the boat. Bucktailing is not a leisure activity! The bucktailer is constantly altering his speed, steering the boat in sharp and wide crescent turns, doing figure of eight turns in open water, and driving parallel along kelp beds. The angler is also highly tuned to the action of his fly. There can be few angling experiences that rival the sight of a "V" wake of water coming up behind your fly as a salmon moves in to strike!